MORE the 500 people turned out for the unveiling of a new commemorative sculpture in Timolin. The sculpture, erected at the entrance to Timolin village, was commissioned by Kildare Co Council to remember the 1903 Gordon Bennet race. The American team set up their head quarters in Timolin during the famous race and the sculpture was commissioned to acknowledge this. It was not only the first motor race to take place in the country but it was also the first major tourist event to take place. Gordon Bennet’s father owned The New York Herald and he was sent to Europe to start a European edition of the paper. To help promote the paper he began sponsoring anything new and innovative and the motor race was just that. Vintage enthuasistas travelled from all over for the unveiling of the new sculpture, created by Celbridge artists Fifi Smith. “There was a great atmosphere, we had lots of music, vintage groups, around 30 Gordon Bennet cars and Greise Youth Theatre in Ballitore put on a play Back in Time about the race,” said organiser of the event Patricia Berry. The monument was unveiled by then mayor of Kildare, Cllr Martin Miley, in his last official function before he finished his term. It was also the last official event for Athy Municipal District manager Joe Boland, who left the role to become Kildare/Newbridge Municipal District manager. The idea for the monument came from the Moone Timolin Tidy Towns Group, and in particular Seán Cleary and Bernie Harrow. The sculpture is a silhouette of the winning car crossing the finish line on 2 July 1903 surrounded by cheering crowds. The car in the sculpture is based on one of the cars which took part in the race. 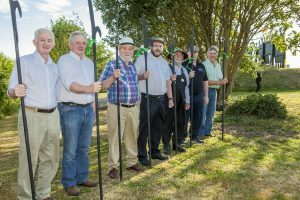 The black silhouettes represent the spirit of Gordon Bennett and the spirit of the people at what was Ireland’s first-ever major tourist event and it served to breathe new life into South Kildare and neighbouring counties Carlow and Laois. “At the time there were between 250 and 300 cars in the whole of Ireland, including Northern Ireland,” said Seán Cleary from Timolin Tidy Towns. A British entry had won the previous edition of the race, which meant that the rights to host the race fell to the Automobile Club of Britain and Ireland. Legislation was passed to allow the race to take place on roads in Ireland, then a part of the United Kingdom. Britain were to attempt to defend the Gordon Bennett Cup against France, Germany and the USA, and each country was represented by three entries, with the car that finished the race in the shortest time winning the race on behalf of his country. There was a 12 mile speed limit on the roads in England and racing was illegal so Ireland became the chosen venue. After much competition Kildare was chosen to host the main part of the route, partly on the grounds that the straightness of the roads would be a safety benefit.